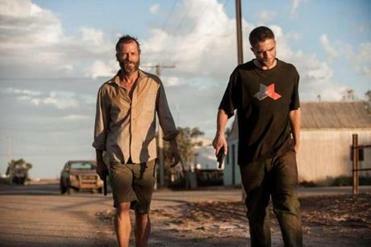 In “The Rover,” the post-apocalyptic tale of a man (Guy Pearce) on a desperate search for his car in the desolate Australian outback, Pattinson plays a troubled sidekick — a slow-thinking man with a Southern drawl, rotting teeth, and a violent streak. The role, which adds moments of strange comic relief to the film, won Pattinson big accolades at the Cannes Film Festival. The actor, 28 and almost two years past “The Twilight Saga,” called the Globe to talk about “The Rover” hours before it had its Los Angeles premiere. The post-apocalyptic action film meanders the line between iconic and generic in a bloody daze. Q. Do you read reviews? A. Oh, yeah, definitely, but I only remember the bad ones. Q. Have you always read reviews? Even during the “Twilight” years? A. It’s really the best I could have hoped to have happened. I’d already come to terms with it being completely not received well and everyone hating it, so everything is a bonus. Q. How did you wind up in this film? I read an interview with your director [Michôd] where he talked about having a meeting with you. I was wondering which one of you was wooing the other. A. I met him before the script was even around. I loved “Animal Kingdom” so much. I like quite aggressive filmmaking. He seems very ambitious, which is very different. When this script came around, it was one of the top five scripts I’ve ever read since I started acting. Q. At what point was it decided that you were going to do a deep Southern accent in this film? 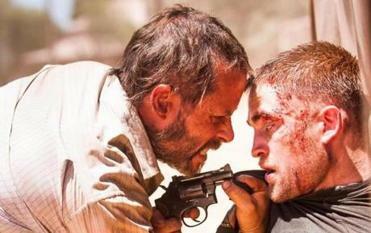 Robert Pattinson (right) teams up with Guy Pearce in “The Rover,” a post-apocalyptic film set in the Australian outback. A. It said in the tiny description of the character that he was from the South, and that was basically the only thing it said about the character. Actually, Southern accents are quite fun to do anyway; you want to start saying the lines out loud. Generally, you want to start being analytical about a part, and with this, it was just immediately — you want to perform it. Q. The accent seemed effortless. A. For some reason, with regional and American accents, my ear’s quite good, it’s quite attuned to it. I can do regional American a lot better than I can do regional English. I don’t know why. I think just growing up on American movies — and from singing as well. I grew up listening to a lot of blues and stuff. It’s that kind of cadence. Q. I want to talk about the wardrobe in this film – and the teeth. You looked believably filthy. A. It’s massive to me, all the costumes and everything, especially shoes and stuff. However generic the wardrobe looks, like the jeans, we’d gone through hundreds of pairs of five-dollar jeans to find the right ones. Q. Were you allowed to shower during this filming process? A. Yeah, it doesn’t make any difference. The second you wake up in the morning, you’re already pouring sweat. [“The Rover” was shot in Australia.] It’s kind of nice because you don’t need to have the makeup touch-up every two seconds. You’re just covered in blood and grime. 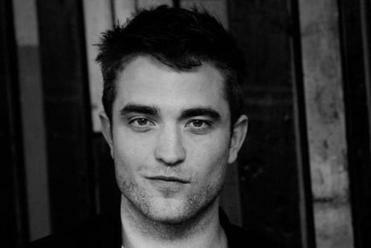 “This [“Rover” look] is nice because you can sit around in a big pile of mud and just enjoy yourself,” said Pattinson. Q. I wondered which was more difficult — to be in this kind of costume or to be in “Cosmopolis,” where you have to look perfect throughout the film. A. I guess both of them. I remember waking up [during the shooting of] “Cosmopolis,” and my hair was stuck in the shape constantly. This [“Rover” look] is nice because you can sit around in a big pile of mud and just enjoy yourself. Q. Speaking of “Cosmopolis,” David Cronenberg is being honored at the Provincetown Film Festival this weekend. You’ve now worked with him twice, in “Cosmopolis” and “Maps to the Stars.” If I get to interview him, what should I ask? Q. According to the Internet, you’re in the running to play Indiana Jones. Is that just a Hollywood rumor or the real thing? Q. You have your big “Rover” premiere tonight. Will your “Twilight” fans still camp out to see you? A. They’ve always been pretty supportive in every movie I’ve done; they’ve always created websites for the movie and stuff. I think everyone I work with is so stunned because they’re very proactive. That’s kind of great and always kind of shocking. Yeah, I’m curious about how people are going to interpret this one. Q. You talk about liking ambitious directors. What’s the next ambitious move for you? A. I just keep getting really lucky. I’m doing [“Idol’s Eye”] in October with [French director] Olivier Assayas and Robert De Niro, which is kind of a ridiculous thing. I met Olivier two years ago and he talked about this script. It’s crazy and I’m so excited about doing it. Things just seem to keep dropping in my lap at the perfect moment. Q. Do you get any chance to read books — or is it all scripts now? A. I just read the Andre Agassi autobiography, which I thought was amazing. I thought it was so great. I read this book by Steven Pinker called “How the Mind Works,” which is also one of the best books I’ve read in ages. It’s about evolutionary psychology. I didn’t understand any of it [laughing]. Q. I should ask what you’re wearing to the premiere tonight. Isn’t that what I’m supposed to ask? A. Really, I’m actually staring right at it right now because I had to get it refitted because I’m a fatass at the moment. I think it’s Alexander McQueen. Interview has been edited and condensed. Meredith Goldstein can be reached at meredith.goldstein@globe.com.